Rushing out of the house this morning, the only thought going through my mind was getting the kids to school on time. My son, Joel, suddenly gave me some hope that his skeptical, six-year-old heart does have room for faith! You see, when my little cynic was only four, he came to the conclusion that Jesus was not at our church. "Jesus is not at our church, Daddy, because Jesus has a beawd (sic) on his face, and nobody at our church has a beawd on they face!" On the positive side, his leaning toward a literal interpretation is foundational for fundamental Christianity. Joel has also struggled with the concept of being able to talk to God from any vantage point while maintaining the assurance that God is listening. The fact that Joel hasn't heard God speak has been a test of his faith. Although he still says his prayers, he usually has one eye open. Lately he's been discouraged by unanswered prayer. "If you keep on asking God for something he should give it to you. But I keep asking for super powers, and I still don't have any super powers!" I've explained, as well as a six-year-old can comprehend, the idea of praying according to God's will. We've also explored the possibility that faith, put to action sometimes yields surprising results. Little boys who always wanted the power of flight often learn how to fly planes when they grow up. I know several dudes who posses super-human strength with a little help from John Deere! Others, with the need for speed, have the option of joining NASCAR. So, prayers can sometimes be answered differently from what we expected. Heading to the truck to take the kids to school, I was pleasantly surprised to hear Joel say, "Daddy, I found the light of Jesus! Come here, Daddy, look!" 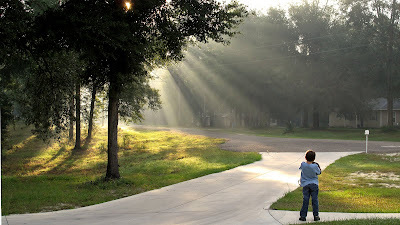 Following Joel into the driveway, I came face to face with the sunrise, diffused through the smoky morning, spilling in beams across the front yard. I was glad to see my skeptic having a spiritual experience! Love it! The grandgirls saw the light beaming through the trees like this a few evenings ago, and related it to God. They ran out into the light and offered up prayers to God. It was absolutely amazing. It made me so happy to see their "childlike" faith in action. Wonderful, pastor. I love this!! Thanks for sharing.